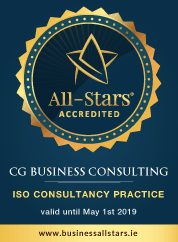 Your organisation could benefit from a FREE OHSAS 18001 Consultation with CG Business Consulting. OHSAS 18001 is generally accepted to all intents and purposes as the most robust Occupational Health and Safety Management System available to companies. OHSAS 18001 was originally prepared as a proposed ISO standard but it has never had the formal recognition as a national or international standard. Despite this OHSAS is internationally accepted as the Health and Safety equivalent as what ISO 9001 is to Quality and ISO 14001 is to the Environment. 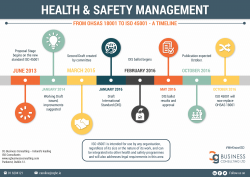 In fact OHSAS 18001 was developed in response to a demand to a Health and Safety Management System that can be integrated with 9001 and 14001. ISO 45001:2016 is the new international standard for occupational health and safety (OHS) management systems and will replace the existing OHSAS 18001:2007 standard. Join our LinkedIn group and keep up-to-date with the latest news on the new occupational health & safety management system, ISO 45001.
that employers can face from poor Health and Safety Management. The 2005 SHWW Act places the legal responsibility for Health and Safety firmly on the shoulders of top management and then allows this accountability to filter through the chain of command. Currently further pressures are being placed on companies from large customers, suppliers, government and corporate bodies to effectively demonstrate a capable Safety Management System. In today’s environment this is even more evident with increased competitiveness in the market companies are turning to Management Systems such as OHSAS18001 as a means for ensuring competence in the companies they do business with as required by the SHWW Act 2005. Enables increased acceptance by regulators, the general public, and other interested parties. Companies that implement and maintain OHSAS 18001 are accepted as being proactive about health and safety and continual improvement. Improves business performance. A well designed, well implemented OHSAS health/safety management system can help reduce workplace illness and injury and increase productivity. Creates consistency throughout the organization built around “best practices”. Certification also provides a platform for attracting lower insurance premiums and proving due diligence to the marketplace. Allows better identification of hazards and risk management and an overall better awareness of health and safety. Place the company in an elite category of business and boosts acceptance and reputation both nationally and internationally. Registration to OHSAS 18001 puts your organization on the identical level of excellence shared by organizations of all kinds worldwide. It satisfies the demands of current or prospective customers for registration. Companies certified to OHSAS 18001 have a superior pool of clients that will accept them as competent, perspective businesses. Improve the efficiency of internal operations. Reduce accidents, danger and downtime and improves safety of all persons affected by the companies activities. Improves management oversight. An effective OHSAS health/safety management system incorporates monitoring and measurement of key performance indicators in health/safety. This gives management objective data upon which to base decisions. Internal auditing is an “early warning system” to help you spot health/ safety threats – giving you the chance to address and resolve them before they are detected by others, rather than after. Facilitates continual improvement. For many reasons – employee morale, insurance costs, liability, etc.- not to mention simple human concern for the welfare of others – nothing in a business is more important than improving health/safety performance. Transforms your operation from detection mode to prevention mode. Prevention is less work and less expense than detection. With an OHSAS Health/ Safety Management System, you mitigate or eliminate hazards and risks to protect the health and safety of employees and others. The benefits to Implementing OHSAS 18001 are endless and when implemented correctly it provides the company with an effective tool that will show return on investment. With continued increases in insurance premiums, increased injury claims and spiralling health care costs the question companies need to ask themselves is; can they afford not to implement OHSAS 18001? We also offer many bespoke Health & Safety Services for Irish companies of all sizes. We can be your Health & Safety Manager, call us today to see what we can offer you.